Dark Horse Announces Powers Product Line, Will Debut At Comic-Con! DARK HORSE DELUXE PROUDLY ANNOUNCES A NEW LINE OF COLLECTIBLES BASED ON BRIAN MICHAEL BENDIS AND MICHAEL AVON OEMING’S POWERS! APRIL 27, CHICAGO, IL–Dark Horse Deluxe, an imprint of Dark Horse Comics, has licensed rights to create figures based on Powers, a long-running creator-owned series of comics and graphic novels by writer Brian Michael Bendis and artist Michael Avon Oeming. 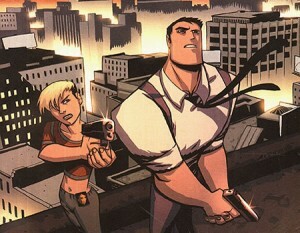 Projects include a limited-edition statue of Retro Girl, a central figure in the first Powers story arc, and a boxed set of vinyl figures of the series’ ongoing principal characters. The Retro Girl statue will be sculpted by Tony Cipriano, who has created many popular superhero-themed collectible statues for a variety of companies. Michael Avon Oeming, working in concert with Bendis and Dark Horse, created special art for the statue, which will be used as control art during sculpting. The statue will capture the stylized nature of the graphic art, while anchoring the figure in realism. “To see your work translated into sculpture is always scary, but I’m very excited to be working with the amazing Tony,” Oeming stated. Dark Horse also plans a boxed set of four-to-five-inch vinyl figures, which will include protagonists Walker and Pilgrim as centerpieces of the ensemble. Both projects are slated for release in the fourth quarter of 2013. The prototypes will be shown to the trade and the public for the first time as part of the product display in the Dark Horse booth at San Diego Comic-Con in July. Retail prices and edition sizes are to be determined. Hot Wheels and DC Mattel SDCC Exclusives Are Up Next! Another day, another set of MattyCollector exclusives. 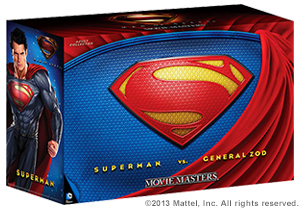 This 2-pack brings to life the super charged battle between two powerful Kryptonians, Superman™ and the General Zod, an exciting diorama set in the city of Metropolis! The package features lights that simulate Superman’s Heat Ray vision, and shows off the Kryptonian’s super strength and flying ability. The diorama is completed with sound effects to help bring the scene to life. Full image will be available on 6/17. This product will be available for pre-order at MattyCollector.com on June 4, 2013, to be picked up at San Diego Comic-Con (details to come). It will also be available for purchase at the show, then at MattyCollector.com on August 5, 2013. In the desperate search for the fabled thirteenth colony, surviving pilots from the Twelve Colonies fly these single-person crafts, ever watchful for enemy Cylons. 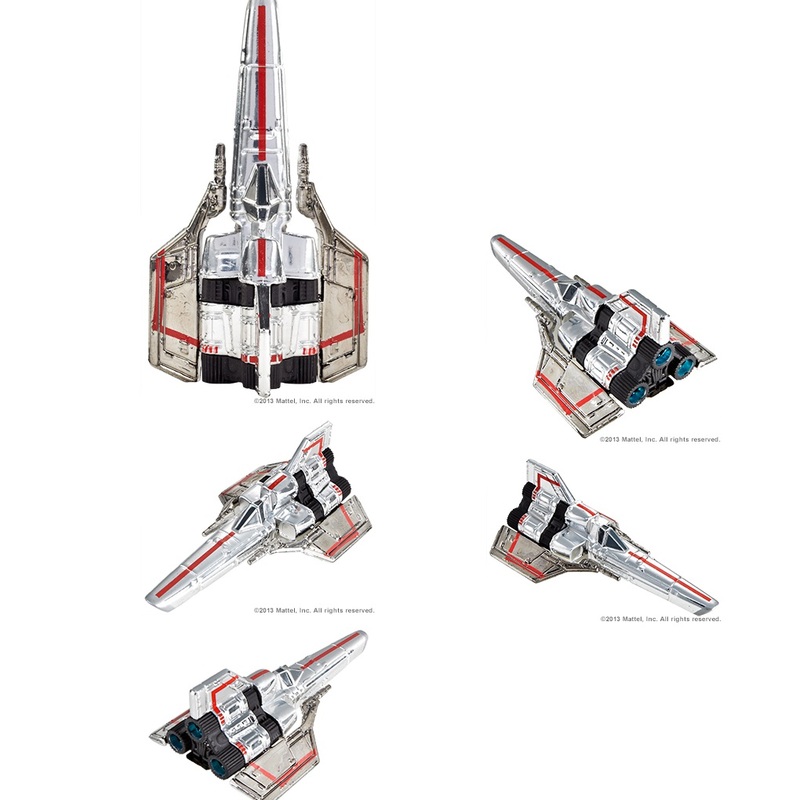 You’ve waited for many yahrens… now you can celebrate the 35th Anniversary of the original 1978 TV show with this finely detailed replica Battlestar Galactica Colonial Viper! 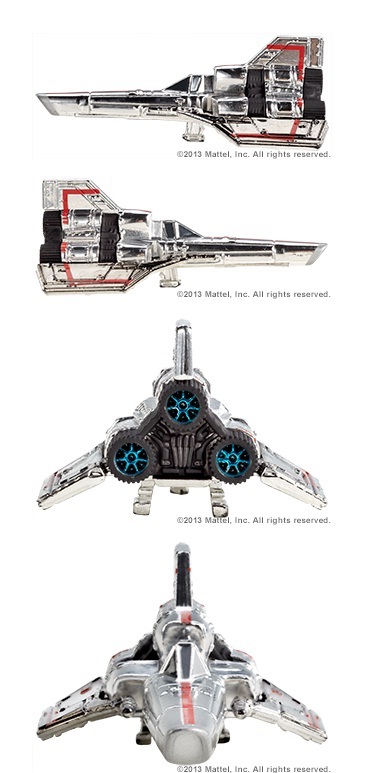 In 1:64 scale with VUM finish and die-cast body and chassis, this fighter plane comes on a commemorative blister card that evokes the original Mattel packaging and fits seamlessly into your vintage collection. This product will be available for pre-order at MattyCollector.com on June 4, 2013, to be picked up at San Diego Comic-Con (details to come). It will also be available for purchase at the show. If you booked a room through Travel Planners, keep an eye on your inbox. You should be receiving an email with a few reminders about dates. Of course have those dates for you too! Each room reservation required a deposit equal to two night’s room rate, plus tax, at the time of booking. Reservations may be canceled on or before April 30, 2013 without penalty. For reservations canceled May 1, 2013 through June 1, 2013, a cancellation penalty fee equal to one night’s room rate, plus tax, will be deducted from the original deposit provided. For reservations canceled on or after June 2, 2013; ALL DEPOSITS ARE NON-REFUNDABLE. It’s crunch time people. If you’ve been wavering on attending this year, you only have a few more days to cancel your room without penalty. If you have $2,000 laying around and want to be treated like a VIP, check this out. There are only five perks and one is already spoken for. Be sure to check out the We Can Be Heroes fundraiser to see all the other awesome perks that are available! Help ‘On Dragon’s Wings’ get into Film Festivals worldwide! This film gives the audience a peek into a day in the life of a kid with autism. A 10-minute long ride on the roller-coaster of discovering Zach’s safe environment is no longer the same. Of having to deal with a communication gap between Zach and the person who was supposed to understand him fully; his mother Frederique. Feel the frustration of both mother and son. Meet the every day challenges for someone on the autism spectrum. The visuals of the film make the reality of autism come to live. Camera angles and colour schemes are on purpose very straight, symmetric and as simple as possible; as a reflection of the order people with autism need around them. There are no camera movements, except for the Point of View shots. With the use of a special lens, the audience literally sees the world through Zach’s eyes. At the same moment, sound design makes the audience hear the surroundings through Zach’s ears. Meant to create an understanding how autism can not only affect communication and speech, but also ones senses. Help getting this finished film into the festival circuit, so it can be seen all over the world! Yesterday via their Matty Collector win Mattel has announced information on when exactly you can order and pick-up your toys, even a date for the websale after the con! No exclusives are announced yet but I predict we’ll see a Hot Wheels item, a Man of Steel Movie Masters fig, a DC Universe figure possibly tying into Trinity War or another hot New 52 story, and a girlie DC comics item. We shall see later this month during the promised reveal! Don’t forget… every order that includes a May release product qualifies for a $4 discount on shipping, both subscriptions and orders placed during the regular monthly sale from Wednesday, May 15th at 9 a.m. PT (12 noon ET) through Thursday May 16th at 9 a.m. PT. Want an email reminder? Click here to register. Or, join me on Facebook, Twitter and in our Fan Forums and you’ll get reminders there, too.